MANILA – Hours after the Supreme Court issued its final decision on the Disbursement Acceleration Program (DAP), calls for accountability by the president and his budget secretary continue to be heard. “Even if the Decision has apparently modified the extent and degree of accountability of Pres. Aquino et al, the next move for us now is to make Aquino, et al accountable to the fullest extent for their P157-Billion unconstitutional acts,” said Bayan Muna Rep. Carlos Zarate, one of the petitioners, in a statement. “The Decision affirms our stand that indeed, Pres. Aquino violated the Constitution in his forced declaration of savings and freely spending it based on the administration’s whims, including the supposed influence exerted during the impeachment of former SC Chief Renato Corona,” said Rep. Zarate. 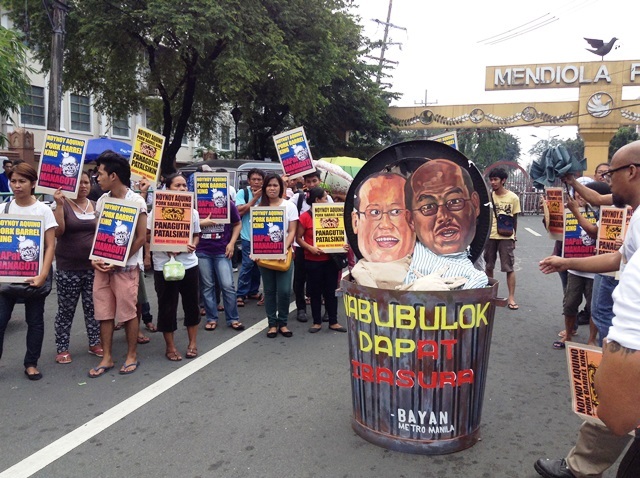 “MRT-LRT fare hike, Mamasapano, and now DAP – all these confirm that Aquino’s bosses are the big capitalists, big politicians, and the US, not the Filipino workers and people,” said Elmer “Bong” Labog, Kilusang Mayo Uno (KMU) chairperson. KMU questioned the Aquino government’s defense of DAP, how the DAP was supposedly good for the country’s economy. Labog said this “improvement” is belied by the worsening hunger, poverty and unemployment of the majority of the Filipino workers and people. It said that the Aquino government’s use of DAP funds for various projects, activities and programs serves as the modus operandi by which Aquino and politicians close to Aquino are able to pocket the people’s money. The Supreme Court upheld its decision in July 2014 to declare practices under the Disbursement Acceleration Program (DAP) unconstitutional, including the withdrawal of unobligated funds and their declaration as savings, the funding of projects, activities and programs not covered by the General Appropriations Act, the “cross-border” transfer of savings by the Executive Branch, and the use of unprogrammed funds despite the absence of a certification by the National Treasurer that the revenue collections exceeded the revenue targets for non-compliance with the conditions provided in the relevant General Appropriations Act. It partially granted the motion for reconsideration filed by Malacañang in that it “clarified” and modified its July 2014 decision to say savings can be declared not just at the end of the year, and where and how the president or executive can “augment” to. “Even if the Supreme Court decision has apparently modified the extent and degree of accountability of the Pres. Aquino et al, the next move for us now is to make Aquino, et al accountable to the fullest extent for their P157-Billion unconstitutional acts,” Bayan Muna Rep. Zarate has said. Without filing of charges in “proper tribunals”, the SC decision’s modifications may just become the loopholes from which DAP-like sourcing of public funds could still happen. Since deliberation for the 2015 national budget began, for example, various groups have warned about hidden pork continuing to lard the budget. As an example, in the Bicameral conference committee’s approved budget last December, it raised the PDAF-like funds in five government agencies to P47.2 B ($1.1 B) from the House-approved P37.33 B ($848-M). The special purpose funds included here, according to Professor Emeritus Leonor Briones, are: E-Government Fund, International Commitments Fund, Miscellaneous Personnel Benefits Fund, National Disaster risk reduction Management Fund, Pension and Gratuity Fund and Rehabilitation and Reconstruction Program. Plus the 1987 constitution is joke. It’s about big government. What a pity. Let me see… who elected the President? How can one be employed in the government? Who appoints the top positions in the government? The more money the government have the bigger they become and the bigger the government becomes the more power they have .. more power more corruptions. Because power corrupts and absolute power corrupts absolutely. And who gave these powers the sheeple voters. Do not rely on government or corporation, they don’t have the heart of the people only you, your ingenuity, handwork, and your morality can make you prosper.